Welcome to our online classes. All classes are conducted over Skype, using a newer laptop or PC in a quiet setting at home. If a student misses an online class, written interactions can be reviewed on Skype later. Please scroll to below classes for our student enrollment process. 2 to 4 students per class. Each group class is 60 minutes in length. The duration of each online course is 20 hours. 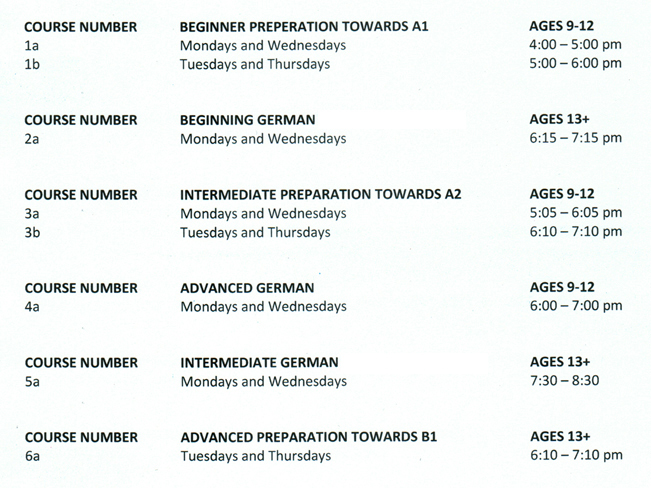 For the German School Online class enrollment form click here. Send your Enrollment and Parent and Student Responsibilities forms to online@gasaschool.org. When enrollment is received, you will get a confirmation email. You will be contacted again by your teacher with more information regarding your individual schedule.